Suited for the South African outdoors, keep your perimeter secure with this weatherproof HD outdoor camera, which features a two-way mic and speaker, allowing you speak with anyone up to five metres away. Night vision functionality also allows you to see clearly at night. The camera connects easily with your Wi-Fi network and with the Yi app you can remotely watch videos and receive alert notifications anywhere, and through the Yi could, you never need to worry about video loss due to the camera being stolen or damaged. • 1080p resolution at 20 frames per second, combined with a 110° lens and universal ball mount delivers clarity in every direction. 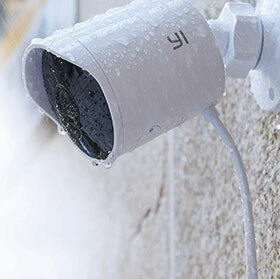 • IP65 rating makes it ideal for outside use and will keep recording rain or shine. • Two-way audio allows you to communicate with welcomed guests and deterrent alarm can get rid of unwanted guests. • YI Cloud anti-theft and cost effective cloud solution. • With up to five devices on one subscription all your footage is safe from theft and damage. • Video compression: H.264 High Profile. • Alarm mode: motion detection. • Night vision: IR Cut + Infrared LEDs allow for night vision up to 15 metres. • Supported platforms: Android 4.1/iOS 8.0 or above.